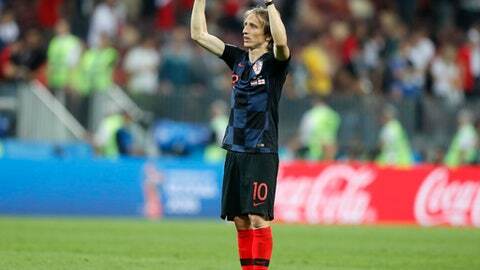 Luka Modric, still in his prime at 32, remains one of the world’s dynamic playmakers. He feeds Ivan Perisic and Mario Mandzukic, who have provided important goals in the knockout matches. France: 4-2-3-1 Lloris; Pavard, Varane, Umtiti, Hernandez; Kante, Pogba; Mbappe, Griezmann, Matuidi; Giroud. Croatia: 4-2-3-1 Subasic; Vrsaljko, Lovren, Vida, Strinic; Rakitic, Modric; Rebic, Kramaric, Perisic; Mandzukic. Nestor Pitana of Argentina will referee the final after working Russia’s 5-0 win over Saudi Arabia in the opener. The 43-year-old Pitana also officiated Sweden’s 3-0 group-stage victory over Mexico, Croatia’s penalty-kick win against Denmark in the round of 16 and France’s 2-0 quarterfinal triumph over Uruguay. He worked four games at the 2014 World Cup, including Germany’s 1-0 win over France in the quarterfinals and the United States‘ 2-2 draw with Portugal in the group stage. France won its only World Cup title at home in 1998, beating Brazil 3-0. Zinedine Zidane scored two goals and Emmanuel Petit added the other. Les Blues lost the 2006 final to Italy 5-3 on penalty kicks after a 1-1 draw. Zidane was given a red card in the 110th minute by Argentine referee Horacio Elizondo for head-butting Marco Materazzi in response to a verbal provocation. David Trezeguet hit the crossbar with France’s second penalty kick in the shootout, and Italy won when Fabio Grosso converted the Azzurri’s fifth kick. France beat Croatia 2-1 in the 1998 semifinals. Lilian Thuram scored two goals for France. France has won three of five meetings, with two draws. The only competitive match in addition to the 1998 World Cup semifinals was a 2-2 group draw at the 2004 European Championship. Croatia will wear its iconic red-and-white checkerboard jerseys for the first time since its opening match, and its shorts and socks will be white. France will wear all dark blue for the second straight match rather than its traditional tricolor of blue shirts, white shorts and red socks, which it wore only for the quarterfinal match against Argentina.